Big Brook as seen from Route 30 in Long Lake. Photo by Phil Brown. I took this photo of Big Brook early Friday evening while driving between Tupper Lake and Long Lake on Route 30. If you’ve driven that highway, you’ve probably admired this scene. And if you’re a canoeist, you’ve probably wondered if the brook can be paddled. It certainly looks inviting. Several years ago, I succumbed to curiosity. 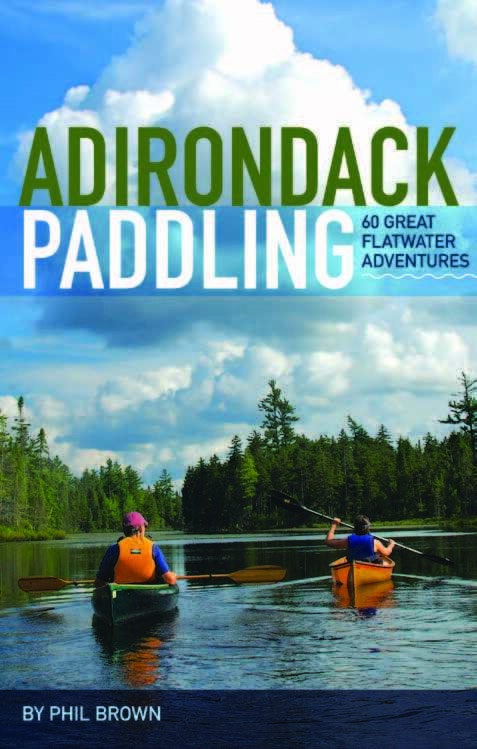 At the time, I was researching my guidebook Adirondack Paddling: 60 Great Flatwater Adventures. I thought Big Brook might make the cut. It turned out to be a dumb idea. Big Brook starts as the outlet of Stony Pond in the William C. Whitney Wilderness, purchased by the state in 1997, and 11 miles later empties into Long Lake. At 6.3 miles, it flows under Route 3, the put-in for trips to Long Lake. Before reaching the highway, the brook passes through posted land owned by the Whitney family. I did my trip in late fall. When I launched my canoe in the early morning, the alder branches were coated with ice. After paddling around a few quiet bends, I heard whitewater ahead and soon found myself trying to navigate shallow riffles and small rapids. At three miles, after passing through other boulder fields and small rapids, I reached a sizable drop, where a spout of water arced downward into a roiling cauldron of foam. I back-paddled and held my place in the current while I gazed at the flume and contemplated the risks of going forward. I didn’t know what lay at the bottom of that cauldron. I was in a carbon-fiber boat not designed for whitewater. 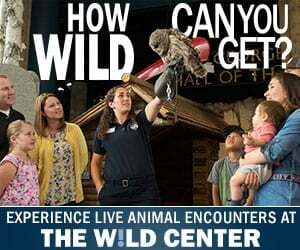 I had almost no whitewater experience. The water was frigid. And to top it off, I had told no one where I was going. What the hell, I decided to give it a shot. I paddled into the flume, landed in the cauldron, and was spit out downstream. It was over in a few seconds. No problem at all. I was lucky. Farther on, I encountered more boulder fields, barely navigable in low water. Finally, I passed under a narrow bridge on Kickerville Road and reached Big Brook’s marshy mouth. For a flatwater paddler, this is the best part of the trip, with great views as you approach Long Lake. 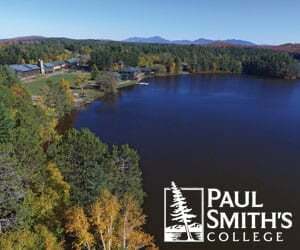 If you want a short outing, you could do worse than putting in at the bridge and paddling to the lake and back, a 1.5-mile round trip. I learned the hard way that paddling Big Brook from Route 30 is not a flatwater trip. 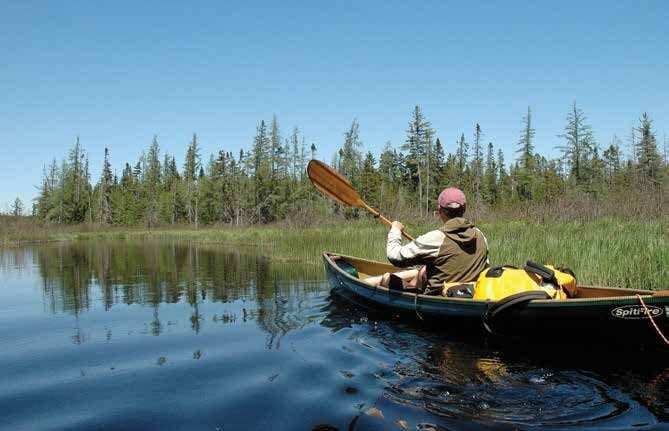 If you’re a whitewater paddler, however, it can be done in spring or in very wet fall seasons. 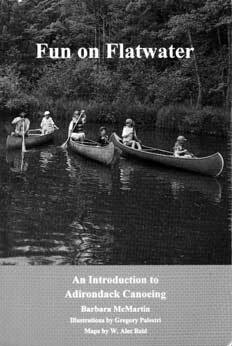 “At other times shallow riffles can make it, figuratively and literally, a drag,” Paul Jamieson and Donald Morris warn in Adirondack Canoe Waters: North Flow. Jamieson and Morris say the rapids do not exceed class II in difficulty in high water. The drop described above seemed more than class II, but perhaps it’s a smaller plunge in high water. Either that, or my memory is exaggerating things. 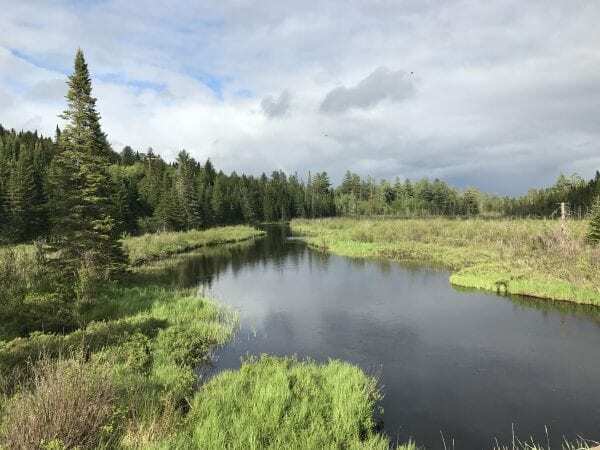 If the Whitneys ever sell the balance of their Adirondack lands (35,000 acres) to the state, the upper reaches of Big Brook would offer the public a fine flatwater trip. Most of this part of the brook is actually a narrow pond known as Slim Pond.